A little insulting but shouldn't the Temple become a central element in the public discourse? In a skit on the Eretz Nehederet satire program, Ayelet Shaked of the Jewish Home is depicted as agreeing to be the victim of a "Gimpel style" sacrifice with nationalist members of the Likud and Jewish Home. 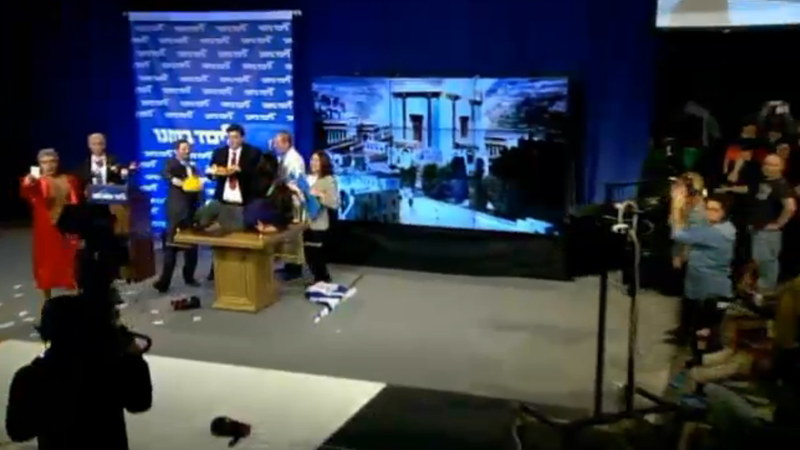 The Eretz Nehedert satire program decided the best way to knock the Right was to have the Temple as a back drop and Ayelet Shaked draped over the Ark of the Covenant with Miri Regev, Tzipi Hotovely, Moshe Feiglin and others gathered around. ‘Yair Lapid’, asked by Bibi if he didn’t mind the Temple service, said, “sure, why not have a barbeque”. Of course, there’s nothing wrong with the Temple becoming a central element in the public discourse.